52% of people in Ireland believe that pain can be difficult to describe and 49% of people think that their pain is not serious enough to discuss with their healthcare professional. This has resulted in less meaningful conversations happening among doctors and patients living with chronic pain and a slower progression of people moving through the treatment pathway to better pain management. People want to improve their pain symptoms but find it hard to verbally explain their pain. 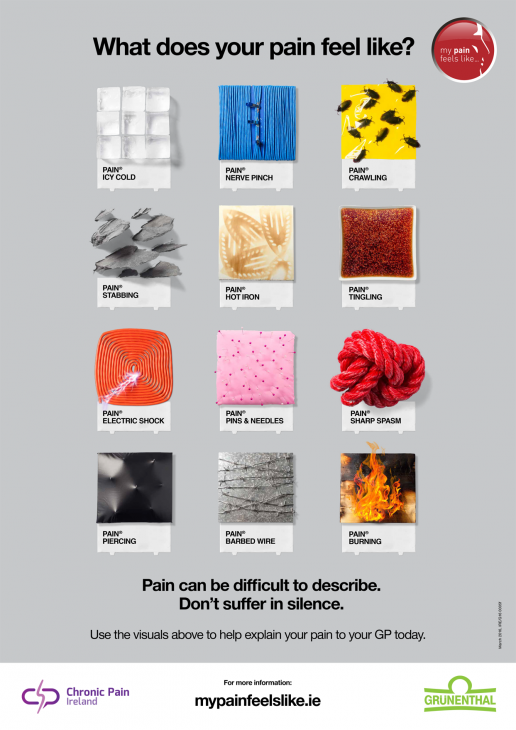 We identified artist David Schwen, a Minneapolis based artist to visually conceive the types of pain that people find hardest to explain so as to aid conversations between doctors and patients. A suite of visual assets – video, posters, GP tool, were used to drive people to visit the campaign website mypainfeelslike.ie. Once within the website, they could complete an online assessment that would facilitate a conversation between them and their doctor about their pain – opening up the topic of pain management and treatment. Campaign reach of 2.6 million people espousing the benefits of ensuring eggs are part of your diet.